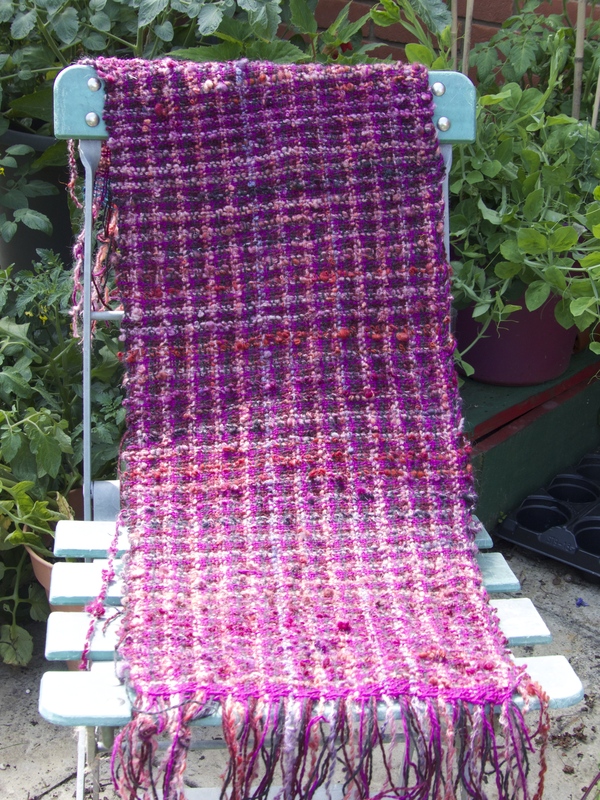 Getting creative with warp yarns is a great way to make the most out of your rigid heddle loom. Using different coloured and textured yarns in the warp, ordering those yarns in a certain way or not at all will yield different, beautiful results without having to worry too much about pattern. boucle and the darker one. For the weft I used the four yarns in the same order to create this nubbly plaid-like sample. Simple to weave, but lots of potential as a cloth. I could easily weave something similar and turn it into a Chanel-style jacket. recently entirely out of handspun. The plan was to make the warp yarns the feature. 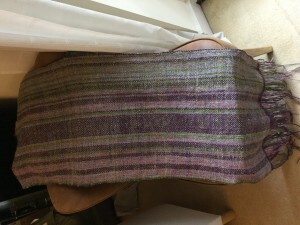 I randomly wound the three colours of yarn—pink, purple, green— onto the warping board. 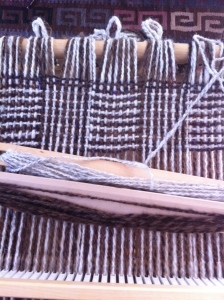 On the weft I used a single colour—a grey mohair and wool handspun with a few dollops of green and yellow as a feature. 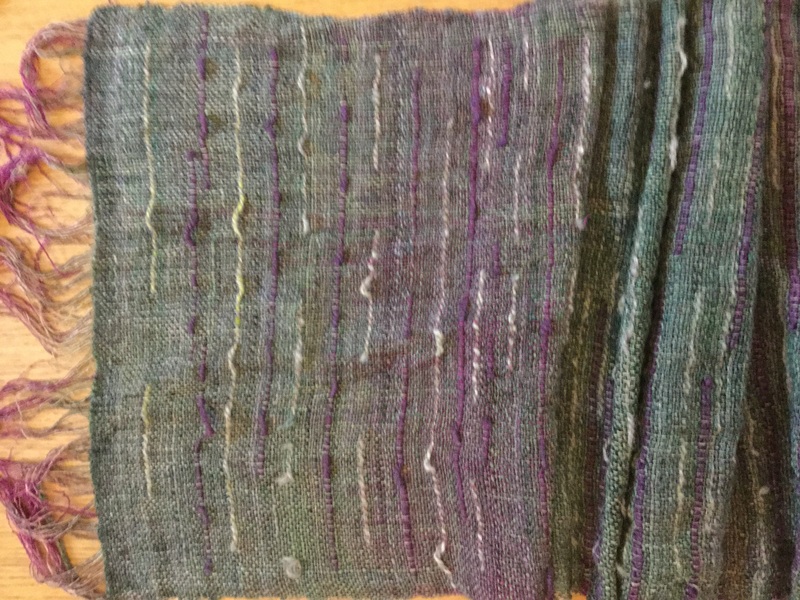 What I like about how this piece turned out is the strong warp colours slightly muted by the greyish weft. Also the slight unevenness of the handspun give the whole piece a subtle speckled effect. 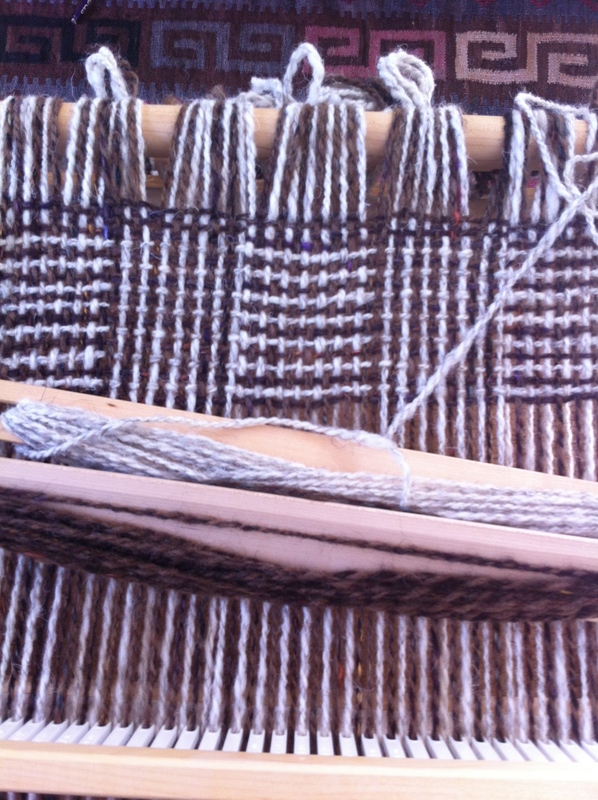 Choosing handspun or many colours of yarn in the warp is one way to use colour and texture in the warp to great effect. A variation on this theme is the multi-coloured warp. Instead of using a few different coloured yarns in the warp, wind on a neutral coloured warp, carefully remove it and then put it the dye pot and apply colour. 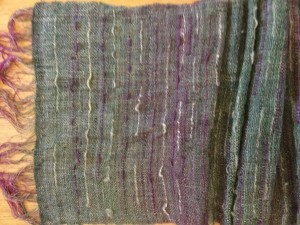 In this sample, I used a commercial silk warp thread and dyed it with gold, purple, green and a little pink. Woven with a camel/silk handspun, with some saori-style accents, the warp still comes through, but this time with different colour pools. 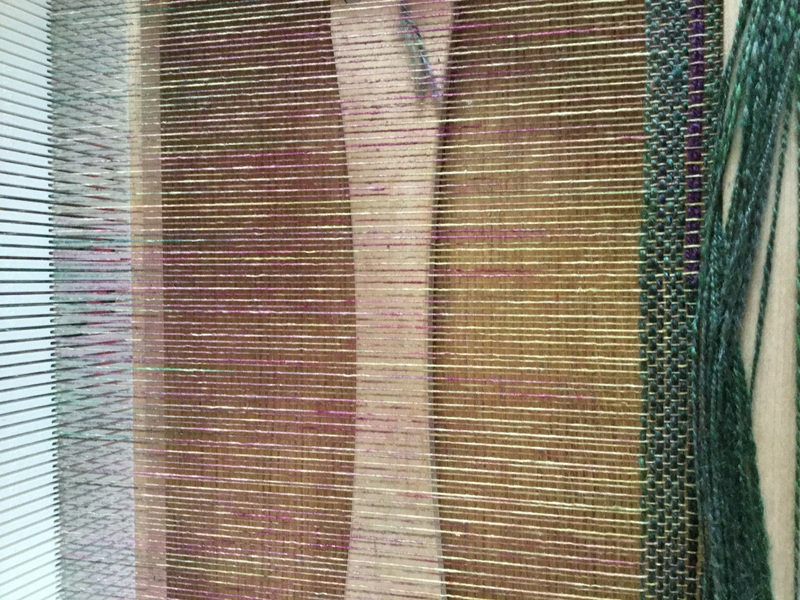 You could take this technique further and go for an ikat-style weave by tie dyeing the warp or even painting a design onto it, then threading the warp onto the loom. Another approach is to take some self-striping or variegated sock yarn and wind your warp so that the colours sit together. There’s a great description of that technique here. Log cabin weave is a rigid heddle loom classic. It’s simple, just alternating blocks of light and dark yarns (LDLDLDLD DLDLDLDL etc) in the warp and then weaving the same way. More about log cabin in my November post. Using multi-coloured handspun or variegated sock yarns that have less contrast also create a nice effect. Check out this blog post on this variation on log cabin weave. I’ve also seen log cabin done with some saori-style embellishments that look fantastic. 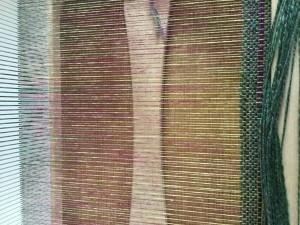 One last technique that emphasizes warp is using the variable dent rigid heddle reed. It’s a reed that allows you to mix up the dent sizes in the reed to then use different weights of yarn. I haven’t tried out this tool myself, but apparently one of the effects you can achieve is a ribbed fabric. All these techniques bring a lot of interest and texture without having to mess around with pick up sticks. Don’t get me wrong, pick up sticks are great, but don’t think you need to use them to get the most out of your rigid heddle loom. I love the idea of dyeing your warp after you wind it on the warping board…also, I want to see your handwoven Chanel suit! Lol. I don’t know about a whole suit. Maybe just a jacket. Maybe.